This cuff bracelet has a hammered surface on the sterling creating an elegant contrast to the polished tube of sterling silver over top. It has my classic curve that swoops down toward the hand and then tucks in comfortably at the palm of the hand. 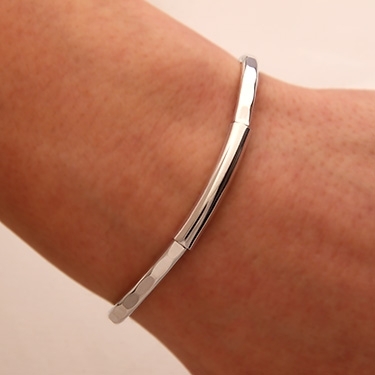 This looks great with the thick straight line bracelets, and especially well with the thin bracelets that have the same curve. All the bracelets are adjustable.